This post is a reprint of the VRMag article, including some bonus images. 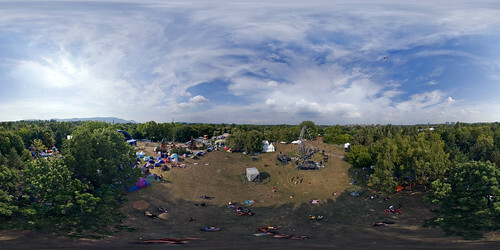 For the second year, I took a kite with me to the Sziget festival. My other hobby is flying kites, and I for quite a while I've been planning to do panoramas from the kite. Kite Areal Photography (KAP) is a specialism among the cross of kiters and photographers, with a considerable history. Modern Kite areal photography was pioneered by Philippe Hurbain, but the idea of taking panoramic photos from a kite is much, much older. Last year I built my first KAP gear and brought it to Sziget. Unfortunately, during the festival the winds were just too low, so I did not succeed. In the year between Sziget 2006 and Sziget 2007 I had a couple more attempts, but wind conditions were challenging and other activities took away my time for experimentation. Andras kept asking me if I would bring my kite gear again this year, and I gave in. I optimized my rig, shaving off a couple of grams, and brought the gear with me to Luzern, and onwards to Budapest; a large single line kite, a Nikon D50 and my custom built kap rig with 2 servos for rotating and pressing the shutter button. Note to self: Next year, do not bring batteries, servos and wires through customs in the same carry-on bag; Security got quite nervous when my bag went through the X-Ray machine at Schiphol Airport. The weather conditions in Budapest were varying quite a bit. When I arrived there were very low winds, and some minor drizzles now and then. Drizzles turned to the occasional shower, equally bad for kiting. Monday morning though, the weather had fully cleared up, and there was wind! There are quite a lot of trees on the island, which make launching a kite a challenge. To overcome the trees, and to launch the kite in a reasonably quiet area, I took my gear to the top of a hill on the island. When I finally got my kite up high enough, I attached my rig to the main line and let out some more line. It worked... My camera was up about 25 meters from the ground, and it was taking photos. Success! I had finally shot my first stitchable panorama. Unfortunately the scene turned out not to be the most interesting, because of my safe positioning; far away from the main stages, and with not too many people around. Good thing though, next day (the last day of the festival) the winds were still good. So I set out for the other spot with suitable winds... right in front of the main stage. About 30 drunk festival goers breathing down his neck: Is going up yet? While I was launching my kite in sight of the main stage, a crowd had gathered around me. Getting the kite up at a stable height, attaching the camera gear and testing it takes a while. As people were getting more impatient, I was getting ready. With my kite up, gear attached to the line and fully tested, I took the kite line and walked a couple of meters away from my crowd. I let out my kite some more, to the end of the line, and started taking pictures. SNAP! I think my exact words were 'Hmm. That was not meant to happen...'. My kite line had snapped free from the winder. My camera, now a pendulum from the kite, was coming down in what was basically a free fall. At this point I had given up my camera and the 8mm sigma lens. I walked back to my bag and ground anchor to so I could put down my remote control. I did not want to see my camera hit the ground, smashing the lens. I really did not want to see my camera hitting a festival goer at a speed of about 15 meters per second, smashing their head. And my kite? Probably stuck in one of the trees ahead by now. In reality, what had happened behind my back, was that the camera had hit the ground. Not the lens. And by pure luck, the direction of the camera was such that when it bounced, it must have been pulled up again by the kite. The camera rig then hit the rigging of a bar that was set up just in front of a couple of trees. The camera rig wrapped around the rigging, keeping the camera off the ground and stopping the kite from sagging lower. Tension was back on the main line, and the kite staid in the air! I could just collect my kite and camera and walk it back to where I started. I examined my camera, and the lens. The lens did not even seem to have touched the ground, and only the grip of the camera had minor scuff marks. The sweet sound of a mirror flipping up and down again confirmed that the camera still worked. Wew... The rig in comparison was quite beaten up. I spent some time putting it all together, examining the damage. Unfortunately by the time I had it all together the wind had dropped. Looking at the shots I took before the camera came down revealed a nice partial panorama. The last shot was taken in my direction, and by pure chance it was taken within half a second from the snap. The shot shows me, if you know where to look, but it also shows the kite line flinging towards the camera like a plastic band. I am currently building a new rig from scratch. When it is finished it will be about a third the weight of my original rig (excl. camera+lens); one of the servos is replaced by a led, and I will be powering the rig from the camera battery. And finally I will probably start using my Tokina 10-17 mm fisheye lens instead of the Sigma 8mm. witch software i should use, if i want to make a virtual reality room. but instead of using drawed walls and sealing, i would like to use real life pictures. so when i take on my VR goggles, i cold see all the pictures as one big panorama picture in 360 degress. i take a picture of every corner and wall in the room. so when i turn around with the goggles on, its like im being in that room, so when i turn around, a computer software, would put the pictures together, so when i look in the googles, its like im being in the room. do you know a lot about VR. would you be able to discover and develop new things in the VR world. I have discovered a lot of posibilities about VR, and bulided up a circuit. it would take the world with a storm. im ready to bring the invention to life, but i need a person with a lot of knowledge in the world of VR. can you give me a name, to a person who might be interrested, in develop a new site of the VR/Virtual Reality world? There's a little bit more information about the 3dvisor for panoramas in this article. Cool, you ought to try kite boarding with a camera as well. That is just too awesome, putting a camera in a kite and taking a panoramic picture ! I love how you can pan around in that picture, I could use something like this in my real estate business ! Great Work.